In its role as a leading partner with some of Germany’s premier music events and happenings — such as the Lollapalooza Festival in Berlin and the Reeperbahn festival in Hamburg — car maker SEAT is making its mark as a young, urban brand. To connect with this audience in a way that is effective and exciting SEAT has also teamed up with Snap to drive customer connection with campaigns that enhance the experience with the help of Lenses created especially for the campaign which ran for four weeks in September. Snap Lenses are a collection of augmented reality (AR) 3D enhancements to live real-world environments as viewed through the Snapchat mobile app. Snap created a total of five Lenses for SEAT including featured event filters, story ads and snappables. Snappables, a new form of Lenses launched in April 2018, are AR filters that apply special effects within the Snapchat app. In practice, Snappables expand Lenses to create shared experiences and gaming capabilities between users. SEAT chose Snapchat as a partner because the AR products offer a unique solution for customers who want to appeal to an audience in a creative and artistic way. In the case of the Lollapalooza Festival, visitors could enhance and share their best moments via Snapchat using an exclusive event geofilter. At a whopping 33% this featured geofilter achieved the highest share rates ever recorded by Snapchat in Germany. 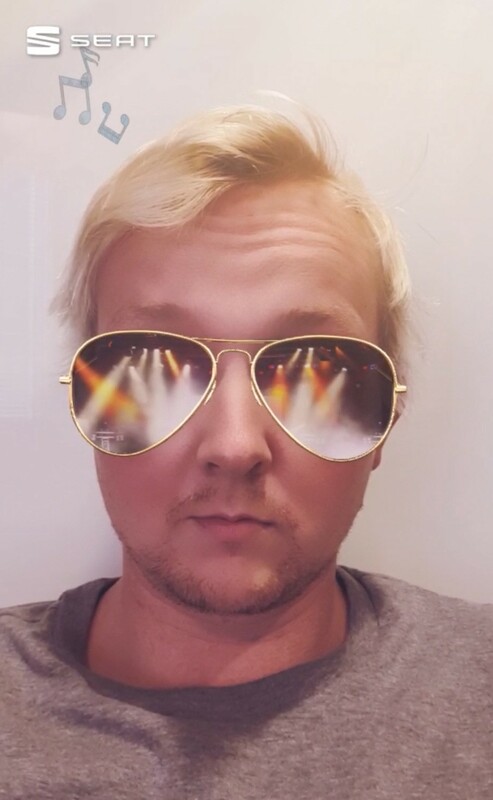 “Special Snapchat features such as geofilter and Lenses create a personal connection to the festival, priceless interactions with the brand and transport the special spirit that the SEAT brand also stands for,” says Giuseppe Fiordispina, Head of Marketing at SEAT Germany. A Face Lens was also used, which you can test yourself using the Snapcode below. Lollapalooza visitors could also use Snapchat to become festival DJs. The first Snappable game, created especially for the German market, allowed Snapchatters to play cool beats and share the fun. The game allows users to play with up to three friends and each gets their chance to step up to the mixing board. On September 15, half-way into the 4-week campaign, SEAT switched up a gear and made it possible for Snapchatters to create their own song. By using two facial triggers, “Raise-Eyebrows” and “Open Mouth”, users could combine up to three different levels of music. You can try out how this works with the Snapcode below. On September 22, SEAT took users into a brave, new world with Portal Lens. This Lens lets users get in on the action — literally. In this environment, the user enters a room that shows the contours of graffiti on the walls and can grab a spray can and start spraying the walls. Once the artwork is finished, the user is greeted with an individual Face Lens that uses the style of the graffiti created by that individual user. Try it out yourself with the Snapcode below. The current collaboration builds on the long relationship between the companies that dates to 2017 when SEAT and Snapchat partnered for the Wireless Festival. The campaigns hit milestones for Snapchat in Germany, and were made possible in close collaboration with agencies and partners including Esome (Jakob Diener, Max Schulze-Bramey, Jennifer Henning), PHD, (Meltem Caliskan, Dominik Huefner, Jana Dumke), c14torce (Marc Czymai), SEAT (Giuseppe Fiordispina, Katharina Kasper), Snap (Michael Krynicki, Bastian Steppin, Liane Siebenhaar, Kezia Boafo, Oliver Wapshott). This article was written by Peggy Anne Salz, Chief Content Officer of the MMA Germany, mobile analyst, industry journalist, and content marketing strategist at MobileGroove.